So I’ve been listening to P-Funk a lot lately. As it happens, the first song on the CD that I, ahem, borrowed from my teacher’s aide is “Flashlight”. For some reason, the line that goes, “Most of all, he needs the funk”. For this reason, I’ve been walking around school answering kids’ questions by saying, “Most of all…” and then completing the answer. In this way, I hope to not only answer their question but perhaps enlighten them to the wonders and mysteries of Parliament Funkadelic. We’ll see how it goes. Since I’m in this mode, I thought I’d reply to the Arbor Brewing Company stout release in this fashion. Spot light! Most of all…the stout release yesterday was awesome. Four beers were trotted out last night and they were all good. 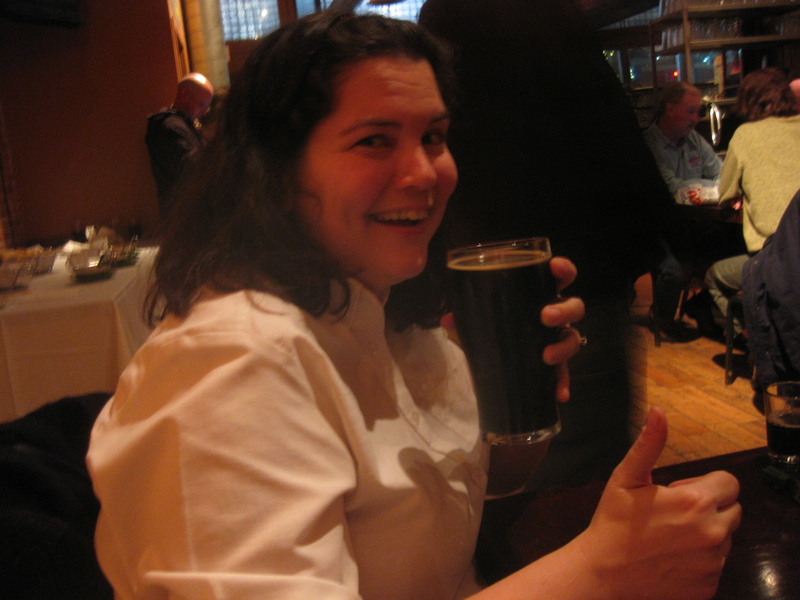 Most of all…the Faricy Fest is the typical “stout” that is often on the menu at ABC. It has notes of chocolate and espresso, with a bit of a smoky finish. It is 4.5% ABV, according to the menu. If you are not familiar with stouts, this would be a good “gateway” beer. Most of all…the Blackheath Sweet wasn’t as sweet as I feared it would be. When I heard the friendly bartender describe this as “sweet”, I thought, “Uh oh” because I really don’t care for sweet beers. But it wasn’t…it was more of a semi-sweet finish. This may make absolutely no sense, but think of “sweet” as gooey chocolate brownie–it ain’t like that. It’s more of a laid back sweet taste that kind of whispers to you but doesn’t shout at you. I also read something about how usually these types of stouts are made with lactose but they didn’t do that for their vegan friends. That was sweet (get it? I’m a master). Most of all…the St. Pat’s was described as the “heavier Faircy”. This would be your next step up the stout ladder, as it were. It was fuller and richer than the Faircy, with more of an alcohol “hit”. This was my second favorite beer of the night. Think of it as Faircy, squared. Most of all…the Steamroller. This was my absolute favorite beer of the night. It was 11% ABV (!!!) but you’d never know it. It was smooth, easy drinking and had a nice bold taste with a rich mouthfeel. I must confess that I heard it was an imperial stout and feared it would be too much…but it wasn’t. Be careful though as it is, as I said, 11% ABV. …everybody’s got a little light under the sun!! I have decide I need to branch out to Sly and the Family Stone….